SHORTLISTED FOR THE BAILEY'S WOMEN'S PRIZE FOR FICTION 2014. From the award-winning author of 'Half of a Yellow Sun,' a powerful story of love, race and identity. As teenagers in Lagos, Ifemelu and Obinze fall in love. Their Nigeria is under military dictatorship, and people are fleeing the country if they can. The self-assured Ifemelu departs for America. There she suffers defeats and triumphs, finds and loses relationships, all the while feeling the weight of something she never thought of back home: race. Obinze had hoped to join her, but post-9/11 America will not let him in, and he plunges into a dangerous, undocumented life in London. Thirteen years later, Obinze is a wealthy man in a newly democratic Nigeria, while Ifemelu has achieved success as a blogger. But after so long apart and so many changes, will they find the courage to meet again, face to face? 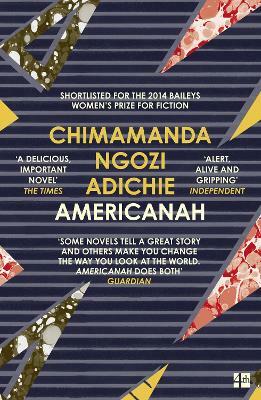 Fearless, gripping, spanning three continents and numerous lives, the National Book Critics Circle Award-winning 'Americanah' is a richly told story of love and expectation set in today's globalized world. Chimamanda Ngozi Adichie was born in Nigeria in 1977. Her first novel `Purple Hibiscus' was published in 2003 and was longlisted for the Booker Prize. Her second novel `Half of a Yellow Sun' won the 2007 Orange Prize for Fiction. Her short story collection, `The Thing Around Your Neck', was published to critical acclaim in 2009. Her work has been selected by the Commonwealth Broadcasting Association and the BBC Short Story Awards, has appeared in various literary publications, including Zoetrope and The Iowa Review. She won a MacArthur `genius' grant in 2009, and in 2010 appeared on the New Yorker's list of the best 20 writers under 40. Her third novel, `Americanah', was published to widespread critical acclaim in 2013. She lives in Nigeria.